The Old Hallowell Day Committee takes great pleasure in announcing our selection of Kieran Kammerer, M.D. as the recipient of the 2016 Timson Community Service Award! Dr. Kammerer is being recognized for not only pitching in himself, but also for rallying neighbors and others, to support worthwhile causes in the local and global community. A few years ago, he was instrumental to the successful launch of the Hearts for Ezra foundation, a nonprofit started in Hallowell, Maine by Ethan and Emily Bessey after their infant son Ezra was diagnosed with Spinal Muscular Atrophy (SMA)—the #1 genetic killer of children under two. The foundation has not only raised awareness of the importance of genetic testing, but has also raised over $30,000 toward research to find a cure. (Note: their live online auction is now in progress through June 14th at noon, at https://www.winningcause.org/heartsforezra/). Kieran, his wife Tamara, and dozens of other volunteers helped inaugurate a kids’ ‘Fun in Motion’ event, celebrating healthy active bodies while raising SMA awareness. Thanks to the Besseys’ continued leadership and additional volunteers it has now sustainably evolved into a much-anticipated Old Hallowell Day tradition for families to enjoy and kids to let off steam at Vaughan Field, after the parade. Hallowell owes a debt of gratitude to Kieran, who describes himself as “never one to stay idle”, and to Tamara for the presence of the colorful Adirondack chairs along the boardwalk at Granite City Park. He relates how they spotted similar chairs while out on a drive last year, and immediately envisioned them livening up the Hallowell waterfront scene as well. Kieran sold the idea to his fellow Board of Trade members, and agreed to take on the task of locating sturdy, well made chairs as well as finding area businesses and individuals to underwrite the expense, and having a plaque made for each chair recognizing the donor. Thanks to willing volunteers who have helped with cleaning, storage, transport and set-up, the Adirondack chairs are now back in place for the second season, welcoming Hallowell residents and visitors to relax and enjoy the scenic vista of the Kennebec River. Delighted with the success of the Adirondack chairs, Kieran and Tamara are already looking ahead to possibilities of installing a kinetic sculpture at Granite City Park, to further enhance the waterfront with public art. Kieran will be officially recognized at the upcoming Hallowell City Council meeting which takes place on Monday, June 13th at 6pm at City Hall. The public is cordially invited to attend, to help us celebrate the occasion! 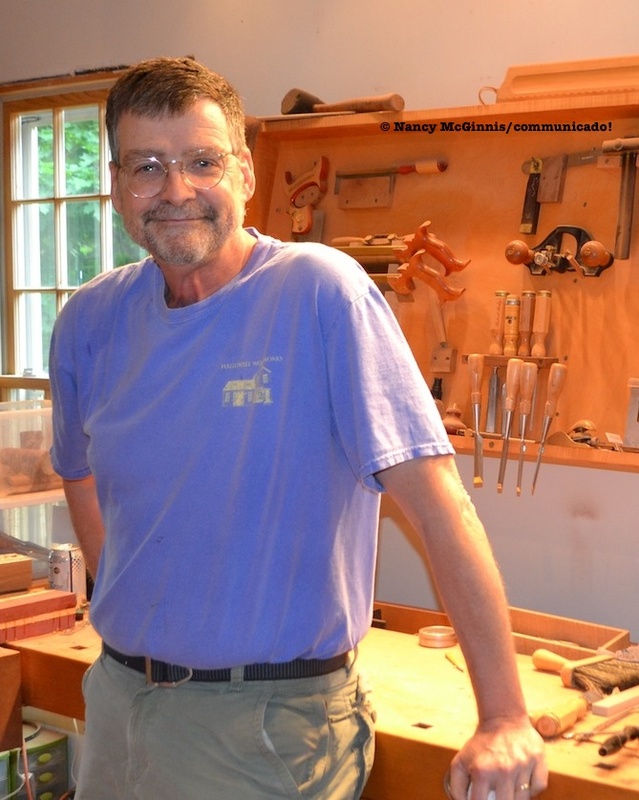 Kieran is shown here in his Hallowell Woodworks, LLC workshop, where he produced wooden “peace sign” necklaces as a fundraiser for Hallowell’s Woodstock celebration last year. Photo credit: Nancy McGinnis/communicado! for Old Hallowell Day.